I enjoyed the pattern very much because it’s knitted flat (I’m not very good at knitting in the round). And I attached a pin on the back so I can wear it proudly, this heart that is very plump and full of gratitude and love for the wonderful, most amazing and supportive man I’m married to. As for me, I did a Valentine’s day heart yarn bomb, which was pretty fun. 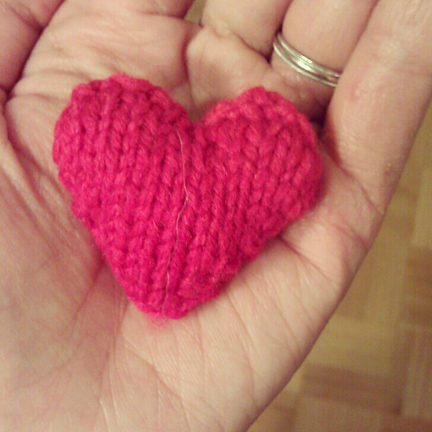 i think planet june has a free crochet heart pattern :D yarnbombing is such an awesome way to share the love! 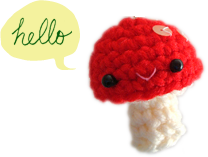 Super cute little pin, with a really sweet sentiment behind it! I was going to say it looked great, too! 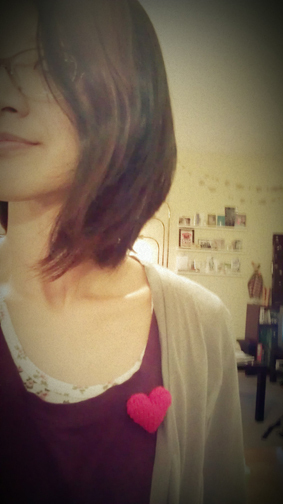 I like how the short hair do is growing out! Fun!